Everyone has distinct childhood memories – moments that defined us and shaped who we became. 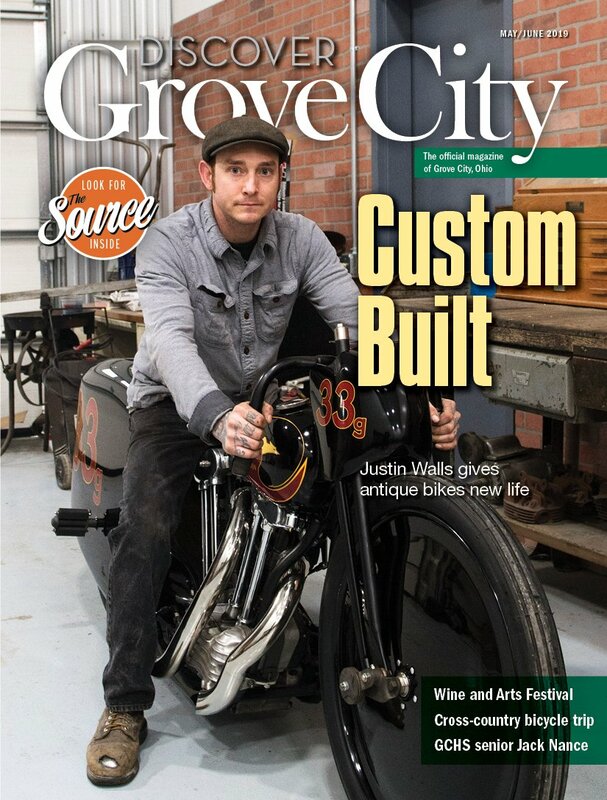 For local Grove City resident Justin Walls, all of his memories date back to his father’s diesel shop. Watching his dad work, Walls became increasingly curious about the motors he worked on and started helping him out in any way possible. Walls says that at 10 years old he and his brother got their first go-karts. As a teenager, Walls started entering dirt bike races with his buddies. Racing came to a swift end, however, when he broke his leg during a race in high school. He then turned his attention to cars, purchasing a Chevrolet Nova with his own money when he turned 16. Cars didn’t satisfy his craving, though, and before he knew it, he was working on choppers and street bikes. This led him straight back to racing, searching for one more adrenaline rush. Walls says he was more careful the second time around, and it wasn’t long before he realized his true passion was fixing up antique motorcycles. “Back in the 1920s, the guys who raced bikes really started everything,” Walls says. Around four years ago, and after a spike in TV shows featuring older bikes, Walls knew it was time to act if he wanted to make it on to the scene. He bought a pile of parts and started building his own antique bikes from scratch, not knowing the future this would provide. Justin and his daughter at Fuel in Cleveland with a 1948 Harley land speed raver he built for Bobby Green of Old Crow Speed Shop. This bike won Best in Show last year at Born Free motorcycle show in Los Angeles, California. Over the years, Walls has acquired more and more tools, making it possible to perfect the antique bikes. Being able to apply modern manufacturing processes to his work, Walls has been able to improve bikes enough to get them back out on the road. Now, Walls’ company, Built The Traditional Way, is getting attention from people beyond the Grove City area. Last year, Walls was invited as a builder for the Born Free Motorcycle Show in California, where he won Best in Show, one of the most prestigious awards. He was then invited to Japan in December 2018 to showcase his 1948 Harley Davidson motorcycle. “I’m a very quiet, laid back guy. I have never asked for a lot of attention, so receiving worldwide recognition for what I’m doing in this industry has been unreal,” Walls says. Grove City Chief Building Inspector Mike Boso, a longtime friend of Walls’ father, nominated Walls for the 2019 COSI STEM Star Award, an award given to a person in the community who shows advancement or understanding of science, technology, engineering or math. Mayor Richard L. ‘Ike’ Stage supported the nomination, ultimately helping Walls. Walls’ biggest fan is his 11-year-old daughter, Kaelynn. Starting a business while becoming a father was one of Walls’ biggest challenges. The end goal for Walls is to eventually step away from the customer service aspect of his business and start building more projects. His vision includes hiring a full-time staff, which will allow him to commit more time to multiple dream bikes. Mallory Grayson is a contributing writer. Feedback welcome at feedback@cityscenemediagroup.com.